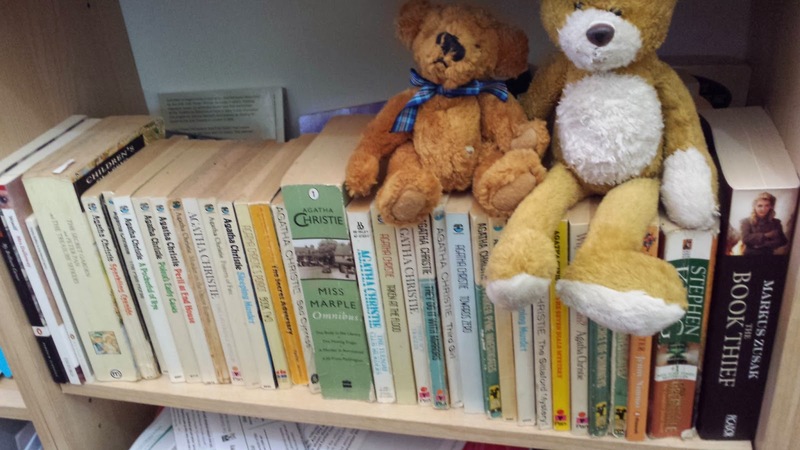 Books and bears. 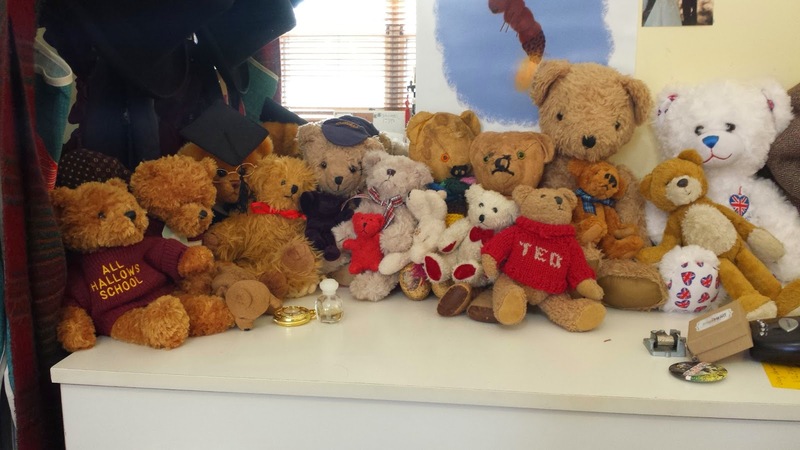 Writing and reading books, making and collecting bears. These things are pretty prominent in the ‘home’ circle of the Venn Diagram that is my life. 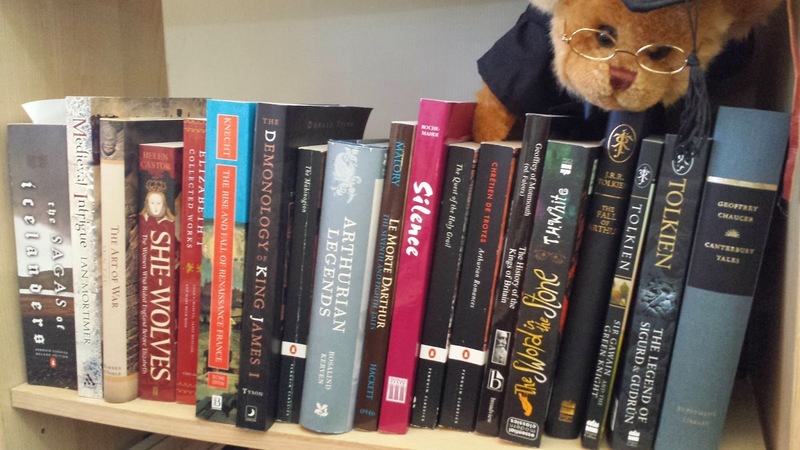 Books and bears have always been not-so-minor obsessions. 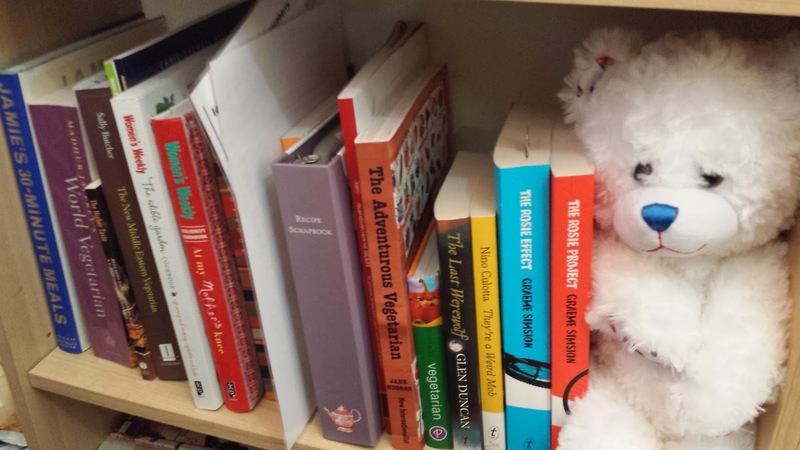 My first stories were about teddy bears. 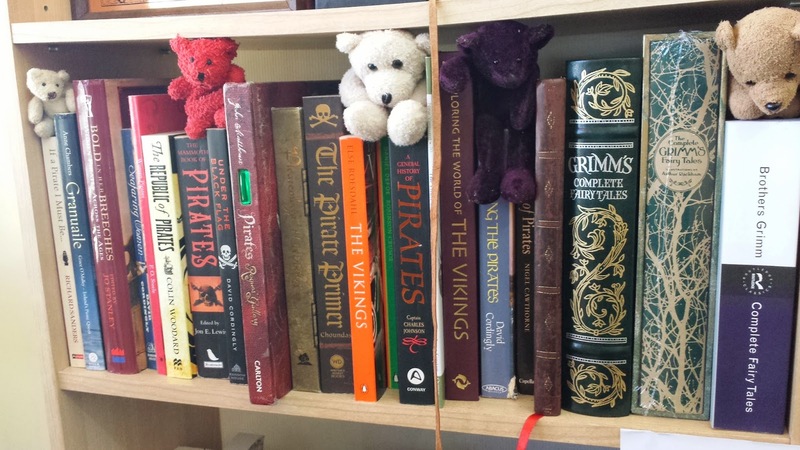 As such, when Emily asked me to do a guest-blog, I figured both bears and books had better feature in some way. Big Bear is first on the list, because he is always first on the list. He is my most precious bear. He belonged to my Mum, and she passed him on to me. 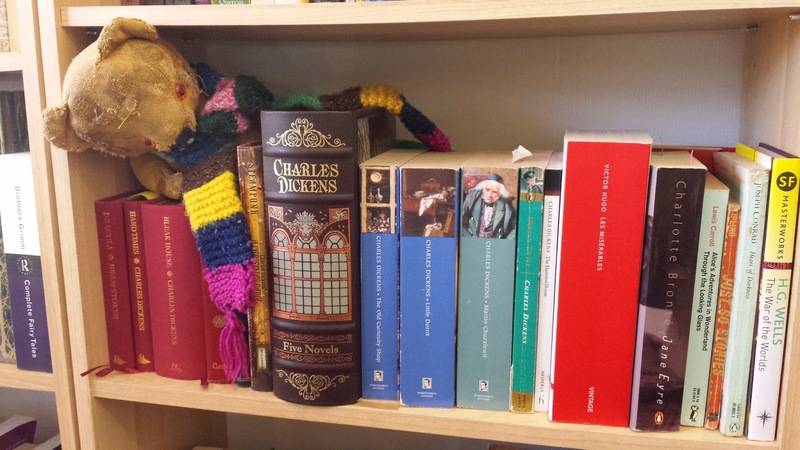 He’s old and very wise, which is why he sits in the Dickens section of my bookshelves. Old Ted belonged to the son of an elderly friend of the family. 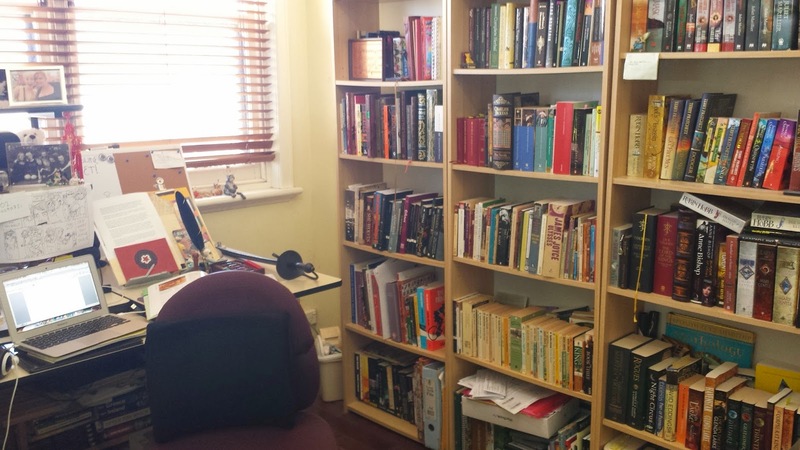 He sits with reference books and Ancient History (fitting?). I use a lot of these books for writing, especially the Dictionary of First Names and Breverton’s Complete Herbal. Josie-bear was given to me by my friend (wait for it) Josie. She is an English bear, and she sings when you press her foot. She sits with Text Publishing books, and the cookbooks I keep in my room. My friend Simon sent me Agatha Christie books in the mail, one by one, until they took up most of the shelf. If I could grow a moustache, I would wear a Poirot moustache. Pollyanna and Bertie don’t have moustaches, but they would if they could. Pirates and fairytales. I’m obsessed. My Honours thesis is on pirates, I’m writing a YA novel about pirates, and I’ve recently started to do some twisted modern fairytales. 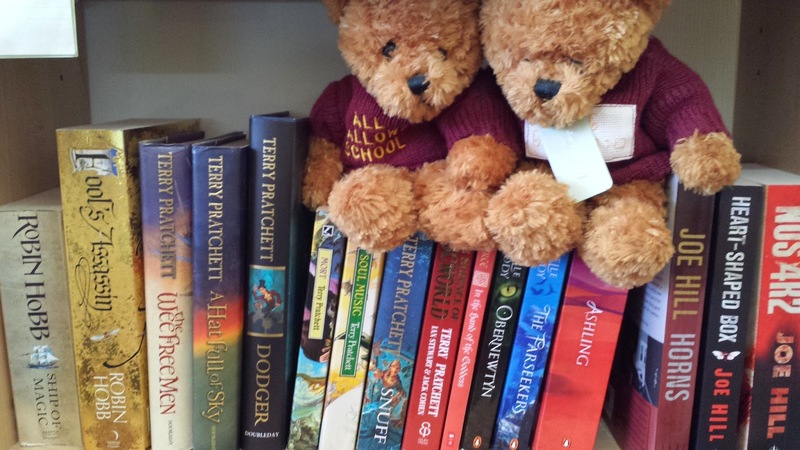 Midge, Little Ted, Patch, Amethyst and Percy just about fit onto this shelf. 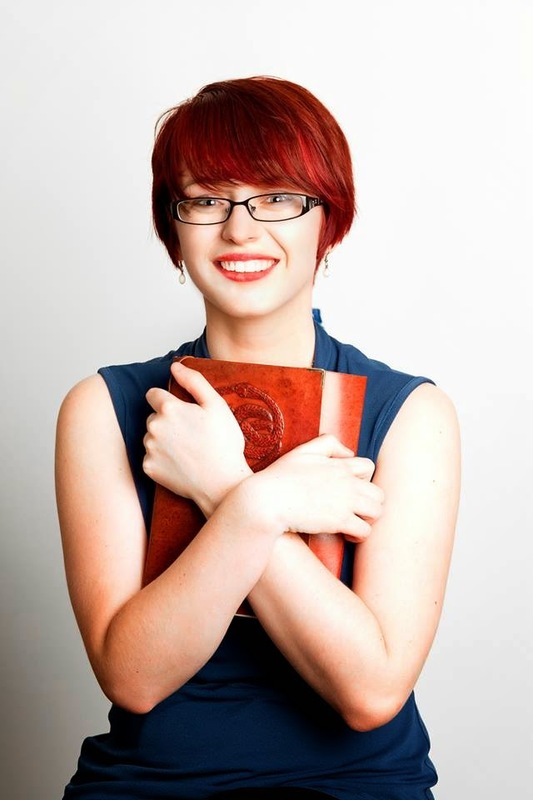 And speaking of dissertations and university, this is Scholar Bear. 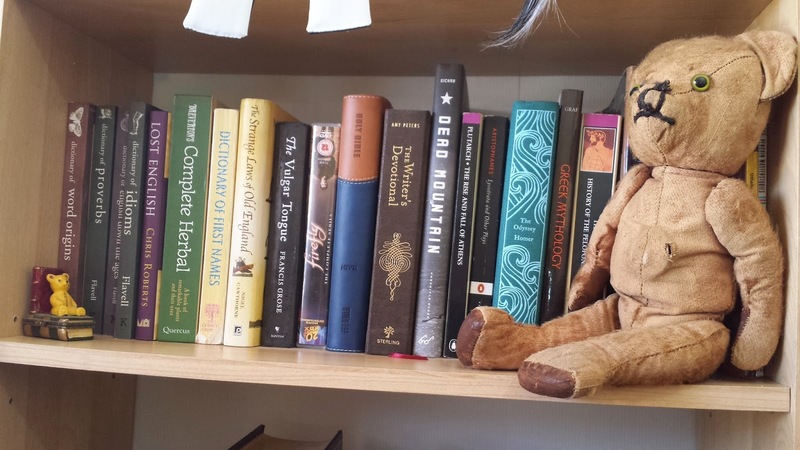 Mum bought him for me as a graduation present, so I thought it fitting he should sit with a bunch of my uni books and research books. Snowy is a sophisticated, seasoned traveller. He sits with my Juliet Marillier books. I have been very lucky to be mentored by Juliet a few times across the years. She is wise and wonderful, and I revisit her books time after time. I should mention that the Elizabeth Haydon books are also on this shelf, but they are scheduled to be moved soon. Stitches has a wonderful tale of travel and escape – far too long for this blog post, but suffice to say he is an adventurer at heart. 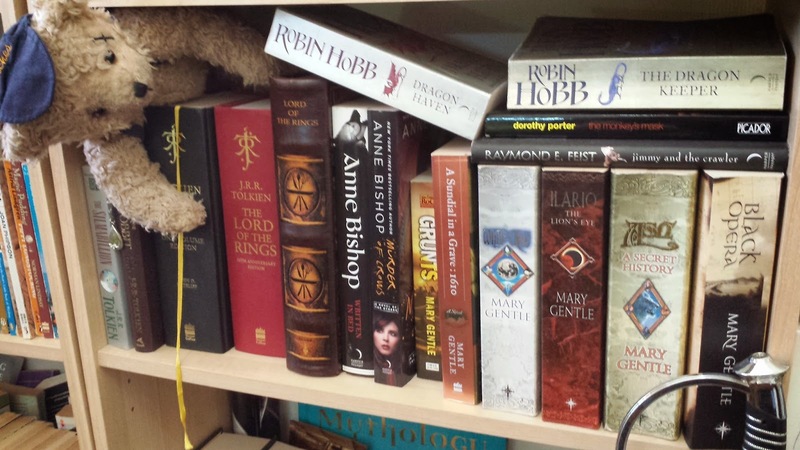 As such, he’s in with the Tolkien, Anne Bishop, and Mary Gentle section of my shelves. The books stacked in top are ones I have borrowed. The Twins are personalised bears from the school I worked at during my GAP year. 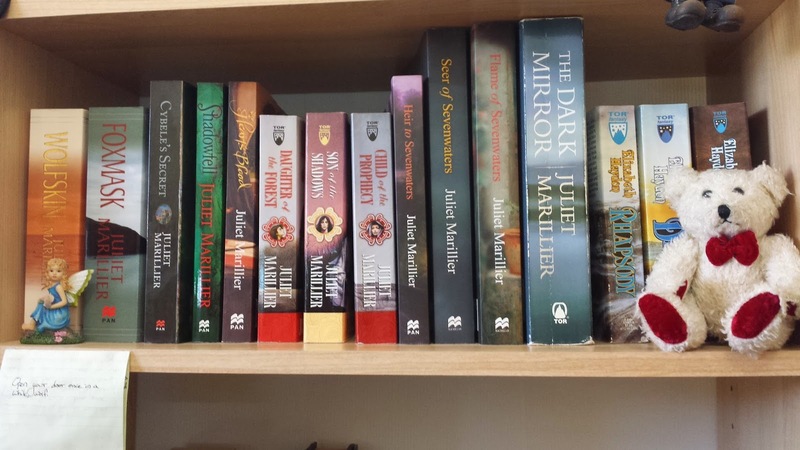 Terry Pratchett, Isobelle Carmody, and Joe Hill suit them very well – a mish-mash within the fantasy genre, but all books that I love. 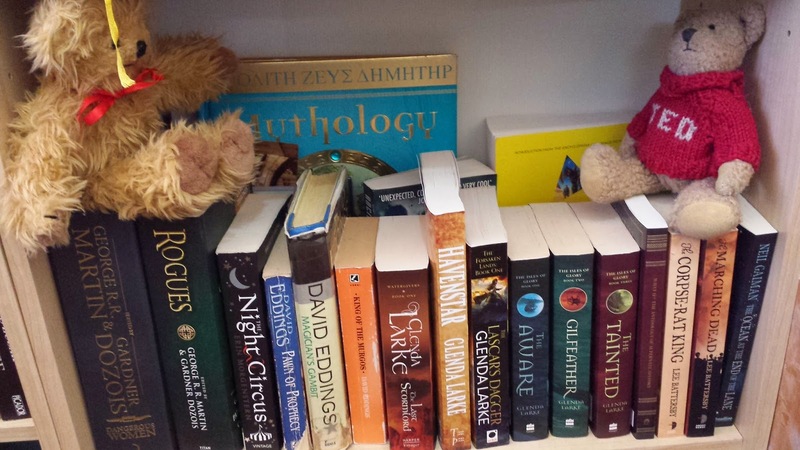 Lucky and Ted (just to clarify, we now have Little Ted, Ted, and Old Ted, which says a lot about why I really need that Dictionary of First Names…) sit on the shelf with some of my favourite spec-fic books, including the intricate worlds of Glenda Larke and the witty swashbuckling of Lee Battersby. There are more books and more bears, but I have a book to write and bears to sew, so I’m wrapping it up for now. I’ll leave you with a snap of the whole family!